In the days following the 2016 election, women and their allies across the country prepared for a nationwide march one day after the inauguration of Donald Trump. When Maria Boutell, a women’s rights advocate and resident of Santa Cruz, heard the hum of national preparations beginning, she knew she wanted to bring the Women’s March on Washington to Santa Cruz. With about 18,000 marchers in Santa Cruz and a great deal of community support, the local Women’s March did catch fire. The surge of support remained strong and the march is back for a second time. Although it was originally intended to be a one-time event, in October 2017 local organizers’ phones began to fill up with inquiries about a 2018 Women’s March. Last year, about 18,000 people gathered in Santa Cruz to march and advocate for women’s rights. This was one part of the global Women’s March on Washington, which took place Jan. 21. Approximately one year later activists will march again, continuing the fight. For the 2018 march, Cynthia Hawthorne, another leader of the Santa Cruz Women’s March organizing group, Nancy Abbey, longtime Santa Cruz activist, and Boutell didn’t shy away from the task of planning. They began making calls and rallying community members for the 2018 Women’s March, which will take place on Jan. 20, the approximate anniversary of last year’s. A year after the inauguration of Trump, the march’s original message still holds strong. “We didn’t target Trump, we didn’t target anybody. What we targeted was women’s rights, immigration rights. We were actually trying to fight for the rights of people who are vulnerable,” Hawthorne said. These remain the values of this year’s march. The organizers also noted the #MeToo movement, which has led more women to speak out about sexual harassment, as another part of what women are rallying around this year. “It’s the same, but a lot of things have taken off. I’ve been following the Me Too movement and that’s really important because these voices […] have been silenced for so many years,” Boutell said. What changed more drastically this year is the planning process. The organizers spent about three months planning compared to last year, when the bulk of the coordinating took place in January and had the help of about 75 volunteers and more initial community support. For the 2018 Santa Cruz Women’s March, Boutell, Hawthorne and Maryanne Campbell make up the three-woman lead team for a 25-woman steering committee. Within the larger committee, individuals are broken up into subcommittees focused on art, volunteer coordination, design, publicity, communications and fundraising. People will begin gathering for the Jan. 20 demonstration at 11 a.m. in downtown Santa Cruz and the march to Louden Nelson Community Center will begin at 12 p.m. UC Santa Cruz feminist studies professor Bettina Aptheker and DACA students are among those delivering speeches after the march. Musical performances and a nonprofit activist fair will also follow. Nancy Abbey, a member of the steering committee, is responsible for planning the activist fair following the march. About 50 organizations, including Santa Cruz Indivisible (SCI) and the Reproductive Rights Network of Santa Cruz County, are participating. SCI board member Lisa Rose noted that last year’s Women’s March played an instrumental role in the formation of SCI and politicization of many community members. By volunteering and participating in the fair, Rose views this year as an opportunity for SCI to give back to the march. The Women’s March lead team also hopes to move forward from resistance to “proactivism.” This involves coordination with other nonprofits and organizations in the area to go beyond reacting to actions taken against marginalized communities. 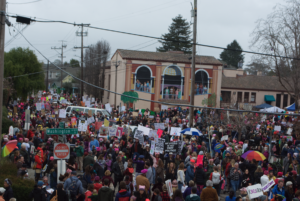 To do so, the Santa Cruz Women’s March wants to work with newer organizing groups like SCI, as well as more established organizations including Planned Parenthood and the NAACP to move toward equity together.